Ospedale del Ceppo is a medieval hospital in Pistoia. The frieze on the Ospedale del Ceppo is one of the most important masterpieces of the Tuscan Renaissance and has long been considered one of the most prestigious symbols of the city of Pistoia. The particular front was created between 1526 and 1528 by Giovanni Della Robbia and his student Santi Buglioni, the nephew of Benedetto Buglioni. Giovanni Della Robbia portrayed the seven Acts of Mercy While the first six panels of the frieze are attributed to Santi, Giovanni would have sculpted the medallions with scenes from the Life of the Virgin and the Medici coat of arms. According to tradition, the Ospedale was founded in 1277 by the company of Santa Maria or "del Ceppo dei poveri" ("The offering trunk of the poor"). In 1345 documents mention ongoing works for a new cloister, oratory and domus (residence for women). It became the main city's hospital after the donations received in the wake of the Black Death of 1348. 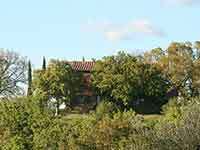 Initially given to the cathedral chapter, from 1350 the commune of Pistoia tried to absorb direction of the company. After the conquest of Pistoia by the Republic of Florence (1401), the Florentines officially confirmed the lay status of the hospital. In 1456 the hospital administrators commissioned the Florentine architect Michelozzo di Bartolomeo a restoration of the building. The election of the spedalingo (rector) was often contended between the noble Pistoiese families, sometimes causing popular turmoil such as in 1498. In 1494 the Compagnia del Ceppo was expelled in 1494, the hospital administrated by the communal priori. In 1501 the hospital was submitted to the Hospital of Santa Maria Nuova in Florence; the Florentine spedalingo, Leonardo Buonafede, ordered in this period the realization of the frieze which is now the main feature of the monumental façade. In 1784 Grand Duke Pietro Leopoldo of Tuscany aggregated the hospital to a new entity including the other Pistoiese hospital of San Gregorio, the Spedali Riuniti di Pistoia, the spedalingo returning to be a Pistoiese. The current complex is the result of a series of additions and restorations of the original 13th-century edifice, which corresponds to today's corsia di Sant'Atto, a large ward with big windows now existing in a 16th-century renovation. In the 15th century the wing and the current façade were added, with the Renaissance arcaded loggia built in 1502, and inspired to the Ospedale degli Innocenti at Florence. The loggia is decorated by a ceramic glaze frieze esecuted from 1525 by Santi Buglioni: it portrays the seven works of mercy, mixed with scenes of the Virtues. A panel was replaced in 1586 by a new one, not in ceramic glaze. Also from 1525 are the tondoes by Giovanni della Robbia, depicting the Annunciation, the Glory of the Virgin, the Visitation and the Medici coat of arms. The corsia di San Leopoldo ("Ward of St. Leopold"), now the seat of the Pistoia Medical Academy, was originally intended for the contagious patients. Medical practitioners are assigned pride of place in the few surviving contemporary representations of Renaissance hospital wards. 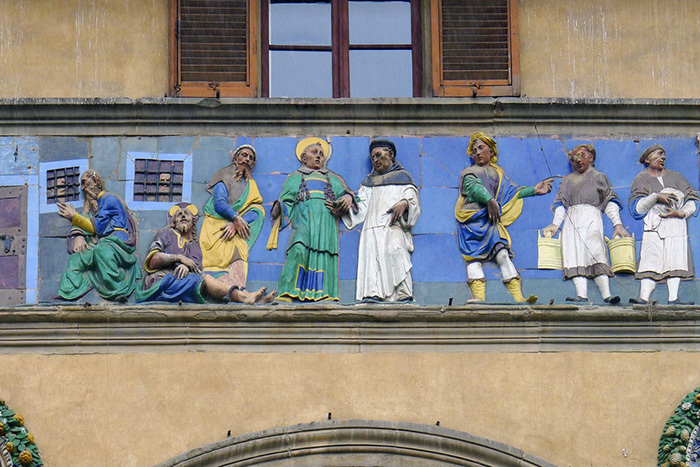 The panel of the Care of the Sick is given particular prominence by Giovanni di Andrea della Robbia's workshop in the frieze The Seven Works of Mercy for the façade of the Ospedale del Ceppo in Pistoia. Giovanni della Robbia, son of Andrea della Robbia, worked in the hospital of the Ceppo in Pistoia in the 1520s in collaboration with Santi Buglioni, nephew and collaborator of Benedetto Buglioni. Santi Buglioni produced there the frieze that runs along the entire length of the loggia of the hospital, representing the Seven Acts of Mercy, while Giovanni della Robbia executed the tondoes on the façade depicting the Annunciation, the Virgin in Glory, the Visitation, and the Medici coat of arms. Con il termine 'Ceppo' si indicava nell'antichità il tronco di legno cavo in cui venivano raccolte le offerte destinate agli indigenti" ("The term ceppo (cfLatin cippus) indicated in times past the hollowed tree trunk in which were collected offerings intended for the poverty-stricken") (Il Ceppo dei Poveri di Prato). Questo file è licenziato in base ai termini della licenza Creative Commons Attribuzione 4.0 Internazionale | Fotografia Alinari | This file comes from Wellcome Images, a website operated by Wellcome Trust, a global charitable foundation based in the United Kingdom. Refer to Wellcome blog post (archive). This article incorporates material from the Wikipedia articles Ospedale del Ceppo published under the GNU Free Documentation License. 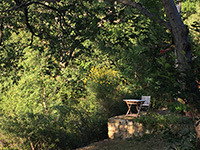 Podere Santa Pia.The valleys beyond Monte Labbro and Podere Santa Pia, a perfect landscape made of enchanting hillsides, oak woods, olive groves, vineyards and small villages.